Well, the turkey got stuffed and so did I. Today mainly with cheese and pate. As another storm batters the Patch I am sitting in front of the fire in a rather comfortable and contemplative mood. It is that time between the Christmas festivities and the New Year resolutions that we look back at the last 12 months. This year I ahve been incredibly lucky. I have had two trips north, one hundreds of miles inside the arctic circle and the other within sight of it. 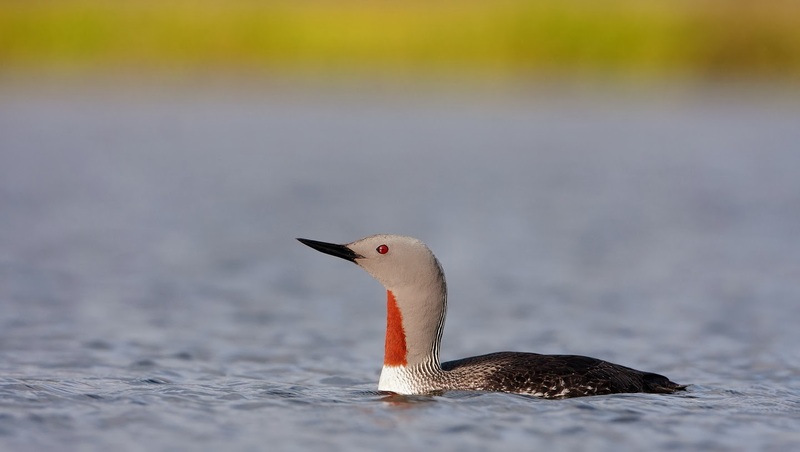 They were both in search of migratory shorebirds, regular readers will know all about my passion for these. The year on the Patch has been brilliant too. More shorebird action and a proper summer for a change. Yes, 2013 was a cracker. Over this post and the next one I'm going to share my favourite 14 images of a year mesmerised by wildlife. The first 8 are from my travels to Norway in May and Iceland in July. Inbetween the time they leave the muddy banks of the Dee and arrive in Porsanger the Knots moult into the most amazing summer plumage. Gone are the 50 shades of grey, they are transformed into a terracotta army. They feed like crazy for just over 2 weeks and then one morning the fjord is quiet. They are all gone. No stragglers, the whole flock just disappears. Staggering. 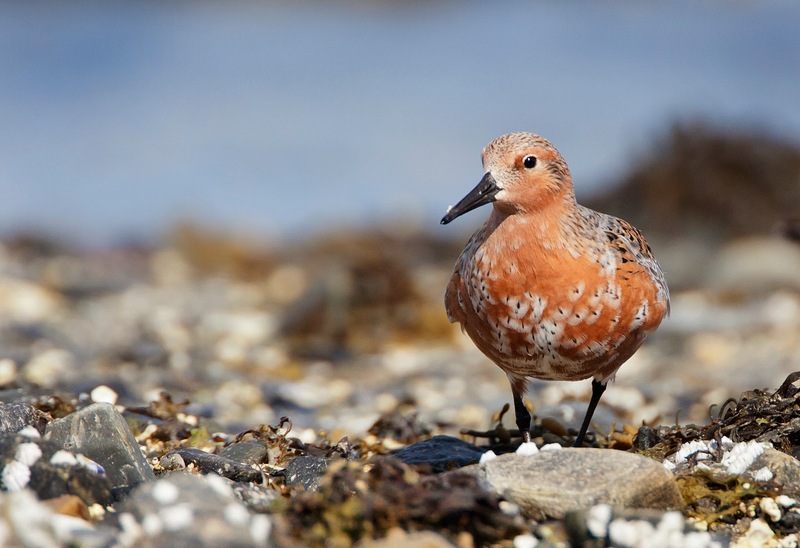 Although the focus is Knots the expeditions to north Norway have allowed me to see some other brilliant wildlife. Otters, Moose, Reindeer and Sea Eagles to name a few but it was seeing a Steller's Eider that really got me. I don't know why either. They seemed so exotic when I was reading about Finmark, near mythical. So far away they seemed out of reach. But there in a harbour of one of the best towns I have ever been to on this earth were a raft of them. First impressions were... "They're.... small!" But beautiful. After dinner one evening I wandered out on to the tundra behind the schoolhouse we were staying in. I wanted to sit on my own on a mossy rock feel the enormity of Finmark. There wasn't a breath of wind or a cloud in the sky. I walked for miles. I found a lichen covered rock (not as comfortable as a mossy one, but more than adequate for my purposes.) A hundred yards to my left was a small stand of really stunted birch trees clinging on to life in a small ever so slightly sheltered hollow. I heard something sing. I had never heard a more beautiful, slightly melancholic song. It was a male Bluethroat displaying. I ran back to the house for my camera and sort of ran back (it was hard to remember where I'd been as there were so few landmarks!) 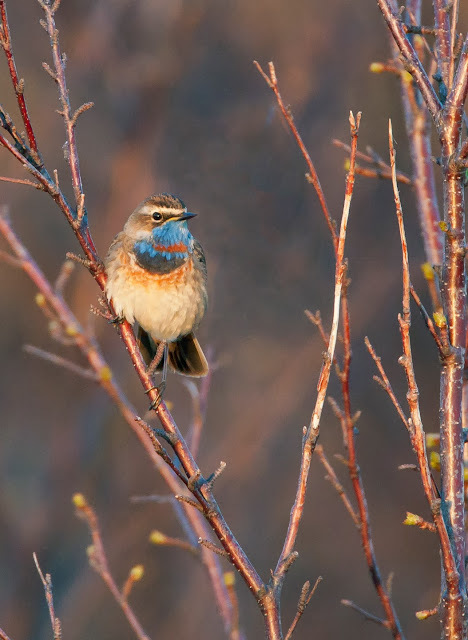 By the time I found my Bluethroat again it was midnight, but that didn't matter as it was still broad daylight. I took a few pictures then left him alone. A breath-taking experience I will never forget. 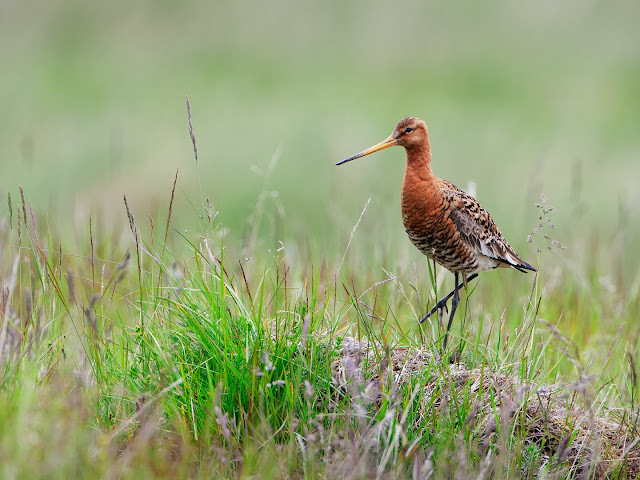 If Norway wasn't enough I managed to get a place on an Operation Godwit expedition to Iceland for 10 awesome days in July. 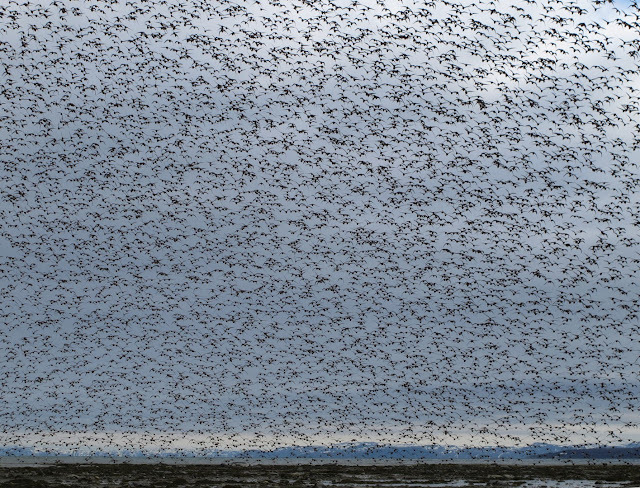 The breeding birds in Iceland were flabergasting. I am surprised the shutter of my camera didn't melt with the number of pictures I took. 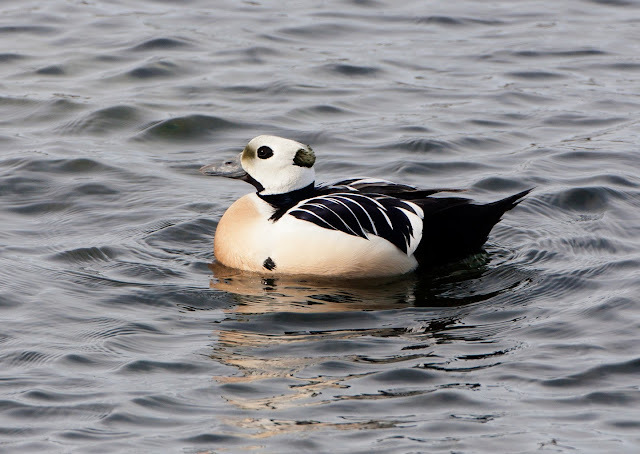 Like the Steller's Eider in Norway a Harlequin duck or two was something I really wanted to see and I wanted to see them in their own back yard doing their thing. I'm not a twitcher (not that I'm anti twitching, its just not for me), it's just I don't want to see a confused vagrant far from its home range. I must thank Gerry the Brent Goose Man for the info on these birds. He told us the road and the exact bridge to stop on to see them, and there they were, precisely where he promised they'd be. 10 years ago this coming May my dad and I went to Sheltand. 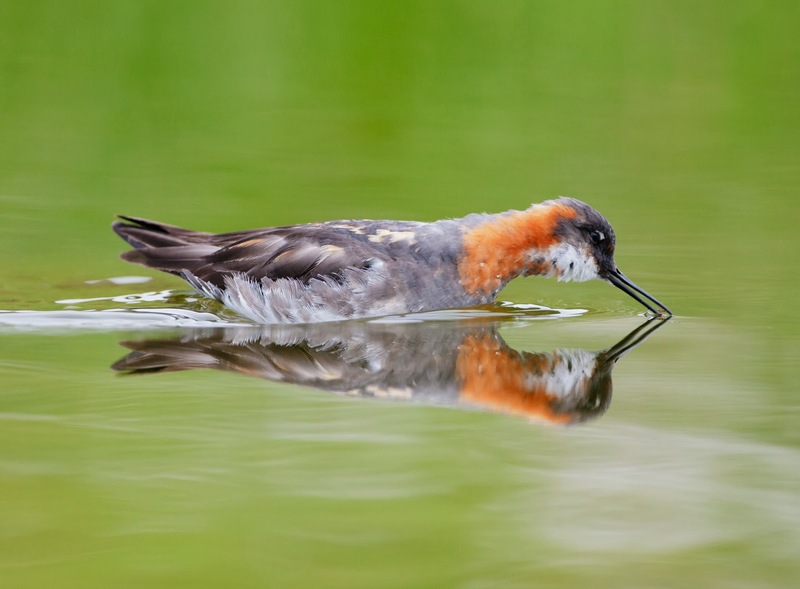 We made our way to the Loch of Funzie to see if we could see a Red-necked Phalarope. We saw two and were over the moon. 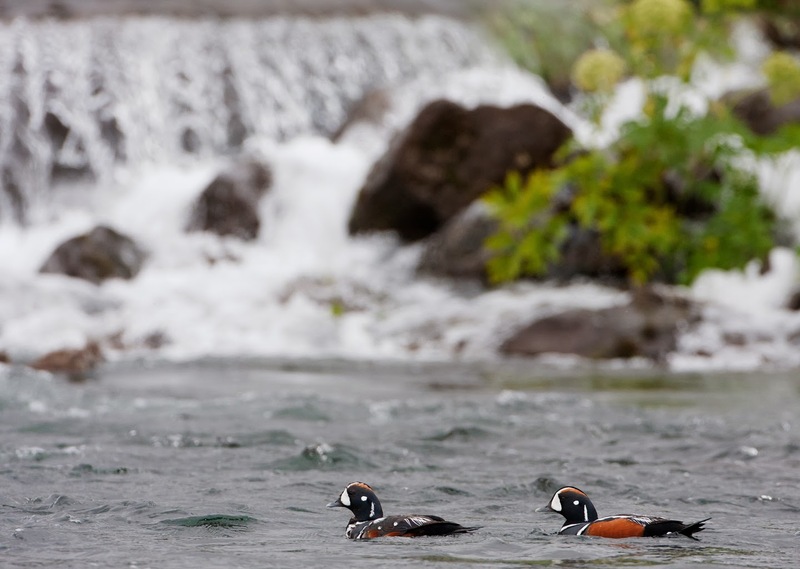 TWO phalaropes! Imagine what % of the British population that was, maybe 6-7%? That used to be one of my best wildlife memories until we stopped at a roadside pool in Iceland and saw a Phalarope, then another, then another etc etc until in a couple of minutes we had seen at least as many as we get in the whole of the British Isles. I had expected to get pictures of Phalaropes in Iceland, I had hoped I would get pictures of Harlequin Ducks, the pictures I got of these graceful divers were a nice surprise. As others on the expedition furled the cannon nets to try for a Godwit catch I slipped away to spend a few precious minutes with the Red-throats. When people think of Iceland they often have an impression of snow, glaciers, volcanoes and barren lava fields. True you can find all of those things there but one feature that I will always remember were the lush wader filled meadows. The grass soft and bejewled by raindrops and the watchful parents of hundreds of broods of chicks. A special place. Eight images from my travels to the perpetual summer light of the north. Next post will have a more local flavour, well, I love the Patch.